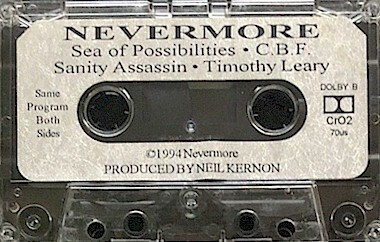 Nevermore started in the beginning of the 1990s, when the band Sanctuary was pressured by its recording label to change its musical style, switching from heavy metal to grunge, which was obtaining mainstream success at the time due to bands such as Nirvana and Pearl Jam (both, incidentally, also from Seattle). Two members of the band – vocalist Warrel Dane and bassist Jim Sheppard — did not agree with the change, and thus proceeded to create a project of their own: Nevermore. By the end of 1994, the band assumed a stable lineup, which saw the additions of drummer Van Williams and former Sanctuary touring guitarist Jeff Loomis. In 1995 Nevermore released its debut album through Century Media Records.